I had hoped to show you some pics tonight, but for some reason they won't load ! So I 'll have another go tomorrow night and content myself with telling you about how the challenge is going. 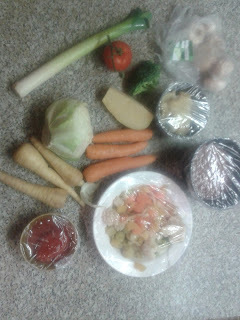 Tuesdays Meals - I started with the usual porridge - I'm really getting through the bag of sugar that I put on the side ! Lunch was beans on a large toasted cob and my evening meal was two a lentil pancakes. This was not a planned meal, but D. enjoyed the "taste" I gave him of monday's lentil balls so much that he ate two with this meal! So the three that I was going to put aside for another day were reduced to one - hardly worth freezing - so I crushed it into the sauce added a small amount of grated cheese and filled two of the pancakes I had frozen last week. I ate these with the last of the coleslaw. 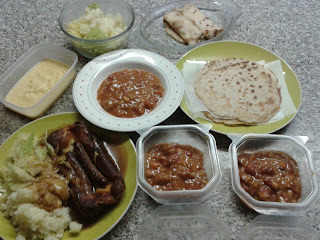 Thursdays (today) Meals - guess what ? Porridge ! lentil Soup for lunch and Sausage, mash, fried onion and processed peas for my evening meal. I find I am struggling not to use the contents of my freezer/ store cupboard to ring the changes.It would be extremely easy for me to live on less than a pound a day as a smallholder, but my challenge was to live on a pound a day for a month with contents bought from a supermarket or shop. That said I'm really enjoying the challenge. I shall bake tomorrow. I was going to make biscuits yesterday, but didn't get time. So tomorrow I will make biscuits and a bacon roll I've been thinking about. I hope I can load some pics tomorrow. you will then be able to see the orphan lambs that we acquired yesterday. Their names are Shaun, Simon, Susie and Sky, who have been named by my granddaughters. The snow is slowly going here, but it is still bitterly cold - which is why the lambs are still in the house.! HOWEVER... The best laid plans as they say.. So tonight I have been collecting 4 orphan lambs.. 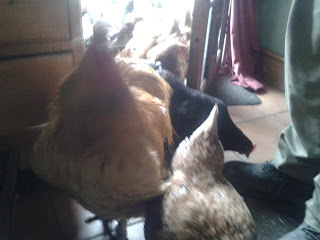 Normally they would go out into the barn , but the temperature is so low and the wind cruel . SO they are inside .........." No S***!" I hear my family cry, as they are used to having lambs under their feet in the house, climbing on their beds and weeing on their duvets and the like. Eldest Granddaughter sourced the lambs, but had to work late, so Grandson came with me to fetch them, in the pitch black to a farm in the middle of nowhere, with no outside lights.. Your'e getting the message now. and yes, I LOVED IT! They will all have a name beginning with "S". There are( I think) three girls and a boy ( called Shaun ) So pictures here tomorrow. 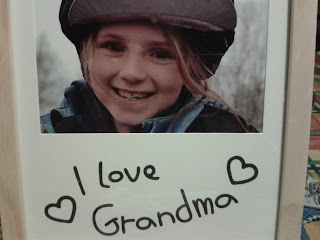 If I know my grandkids they are probably uploading pictures onto facebook as I write! Everything going well in the challenge so far. I find myself missing treats ( biscuits, chocolate etc !!) and some vegetables. I still have money left in the pot so when I have finished the cabbage and carrots I will buy some more and also some red pepper and cauliflower. 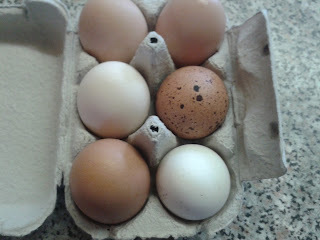 I'm also missing having a ready supply of eggs, as I usually just use what I need, not buy them !! I shall make some biscuits tomorrow. Today I made some lentil balls in tomato sauce. These have a mild curry flavour, but they could just as easily have a Mexican or Italian flavour. it is just that my challenge gives me a rather limited palette. Here is the recipe, sorry if it is a bit vague, just adapt as suits. Cook 100g orange lentils in water, after about 10 mins add half an onion, a stick of celery a carrot and a small potato all grated, add enough water to cover. Cook gently for another 10 minutes. Strain and press, reserving the juice. Turn the oven on to 180o. To the mixture add salt and pepper to taste, a teaspoon of Gram masala and a cup of oats and mix well. Form the mixture into balls, rolled in flour. ( I made 6 large golf ball sized balls from this) Carefully fry the balls in a little oil, turning to ensure a seal. Put these balls in n ovenproof dish. In the pan you fried the balls in pour the juice from the lentils, wash out your mixture bowl with a little water and add this with half a tin of chopped tomatoes, a pinch of garlic granules and some pepper. You might want to add some more spices at this stage, but if you have a young family you might want the dish a little milder. Bring this mixture to the boil, pour over the meatballs and put, covered into the oven for 20 - 30mins. I'll put a picture on the blog tomorrow. Yesterday I had porridge for breakfast, lentil soup for lunch and macaroni cheese, processed peas and potato wedges for evening meal. Today it was porridge (which is perfect in this cold weather!) and egg cob for lunch ( Last egg!) and the lentil Balls tonight. Need to get ready for a meeting now, getting together with a couple of women from out Civic Society who are collecting Oral Histories from our older residents.. Now THEY know about Frugality !! Here's a quick run down on the challenge. Saturday - porridge for breakfast, boiled egg for lunch. Jacket potato, coleslaw and cheese for evening meal. As ED, her husband and daughter were here for evening meal I also tried out a fish recipe on them and D. I'm always looking for new ways to cook fish, especially Ling, which is a favourite of ours that D. catches on rod and line off the coast of Cornwall. I mixed a paste of plain yoghurt ( Sainsburys cheapest) gram masala and salt. Using 3 pieces, I drizzled a little oil onto 3 sheets of greaseproof paper. I spread the yoghurt mix onto the top and bottom of each piece, laid a few pieces of thinly sliced onion on top and wrapped the parcels up and tied them with string. ( I also wrapped up an unspiced piece for granddaughter) I placed these on a baking tray for 20 minutes. Everybody liked fish cooked this way. This was just a taster and D. said he would liked them served with rice as a main meal. I was really pleased with the results. Early night for me - well 11 o'clock is early for me! So goodnight all and welcome to Lisamaywalters. Here is my recipe for lentil burgers - I am using gramms although I'm more confident with pounds and ounces! In a pint of veg stock ( 2 x veg oxo cubes) cook 150gs orange lentils until soft. Combine all ingredients with 50gs porridge oats, pinch of garlic granules and salt and pepper to taste. divide the mixture into 4 patties and fry in a (very) little oil, about 4-5mins on each side. I serve this with coleslaw on bread cobs/buns/rolls/baps - whatever they are called in different parts of this country ! The herbs and spices can be changed to suit different tastes . They are good with a paprika or curry flavour or you could add parsley, sage etc. While this is cooking soften onion, carrot and celery in a little oil. Add a tablespoon of Garam Masala and a good pinch of garlic powder. Strain the lentils, keeping the juice, and add to the softened vegetables. Add salt and pepper to taste. Cook for a further 5 minutes. 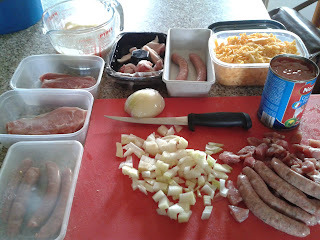 This recipe is using the ingredients I have at my disposal during my 4 week Frugal Challenge. Outside of this challenge I might also add spinach in the final few minutes and be a little more creative with my spices. A couple of small ( nay, tiny) Frugal make do and mend "projects". I have a large bin in which I keep the sweepings from the floor of an old mill. My friend in Cornwall works at this mill and any spilt flour or flour that doesn't make the grade is put in a sack. She and another chicken keeper are allowed to take this flour away. When we visit her, or she us, she gives us this flour, which we keep in a waterproof, vermin proof bin. I scoop this flour into a bucket and mix it to a paste with water and the hens love this as an afternoon treat. Well ( to the point ) the scoop has broken , so I needed to make a new one. Anybody in Frugal, self-sufficient land knows that scoops are made from Gallon containers. This made, I am still left with the other side of the container and feel sure that this could be put to good use. See picture below. Not a brilliant photo I know, but the scoop is to the front and the spare piece at the back. My second Little project is not mine, but Eldest Daughter's (ED). Now anyone reading this who knows me will be saying "What !! Never!! Not ED!!" The reason for this is that while ED recycles ALL her rubbish, she rarely needs to consider the cost of anything and she doesn't MEND anything. However, yesterday she phoned me to say "Mother, you'll be proud of me and I reckon I should get a mention on your blog!" Prepared to be impressed (please) .. She and Youngest Granddaughter both have long hair which they often put up in a scrunchie, these scrunchies have become a little loose and instead of buying new ones she has bought some elastic and revitalised eight scrunchies for £1.00. She says that she thinks that that is a saving of £15 and she couldn't be prouder! So Frugellers lets hear it for little acorns! and yes I really am proud of her. When B. came today he gave me a stick of celery that he says they will not eat, and do I want it? 2 servings of Lentil Dahl - as above less celery and plus remainder of tomato from monday, chilli and garam masala . Half the soup I have frozen in three servings, leaving the other three in the fridge for lunches this week. One of the portions of Dahl was for tonight with rice and winter salad (now with added celery) on the side. the other I have frozen. ( I cooked two servings of rice, freezing the second). I have frozen 2 lentil burgers and refrigerated the other two. Yesterday I had Porridge for breakfast, egg and cheese cobs with winter salad (cabbage, carrot, onion) for lunch and Bacon and sausage casserole with a roll for evening meal. I had porridge again for breakfast today, pasta and cheese for lunch ( extra pasta cooked and refrigerated) and lentil Dahl and rice and salad for evening meal. So far so good. I feel happier having some meals in the freezer as sometimes I might be tempted to stray from the challenge if I am particularly busy. So Friends that's all for now, will be in touch again soon. Thanks to those who have given recipe suggestions... keep them coming! Day one of my challenge ! I forgot to record the cost so far, which are - Lidl £14.51; Sainsburys £1.86; Grocers £1.50 Eggs £1.00 Bread ingredients £1.17 - Total £20.14 - Less than £8 left for the rest of the month !! I'm also going to have to factor in a spoonful of sugar on my porridge. ..Yes I know I'm a wuss! Started the day with a bowl of porridge, which will be my usual breakfast for the next 4 weeks I think! Not a a bad start to the day and keeps you feeling full until lunch. This morning I've had a bit of a prep session. Firstly I made some batter with half a pint of milk and my largest egg. Reserving a cupful I made 6 pancakes. I then made half a pint of cheese sauce. Reserving about a two thirds of this I chopped and cooked in the microwave a quarter of an onion. I mixed the onion with the cheese sauce and rolled the mixture in two of my pancakes. I then fried 2 sausage and some chopped bacon from my bacon bits. I cut each sausage into 5 pieces and then added half an onion and a carrot chopped. When these were just about cooked I added three quarters of a tin of chopped tomatoes, half a pint of stock, salt, pepper, garlic granules and a pinch of chilli powder. I returned this to the heat, covered it and cooked it slowly for an hour. The fat that I had trimmed off the bacon pieces I put aside to render for the evening meal. Lunch was an egg cob, made with salad cream ( there was a small amount of egg mixture left which I put in the fridge ) with carrot sticks as a side. Tonight I have rendered the bacon fat, poured most of the fat off into a tin, into which I have put two sausage and into the oven with the batter mix poured over, on a high temp. I have boiled and mashed two large potatoes and some cabbage and made gravy with the veg juices. I don't intend to give a blow by blow account of my kitchen doings everyday. I think an update of my challenge every three days will suffice, otherwise you will all lose the will to live! Just back from an interesting talk, organised by the Canal Society of which we are members, so this blog is a little late tonight. So here we are and ready to go !! 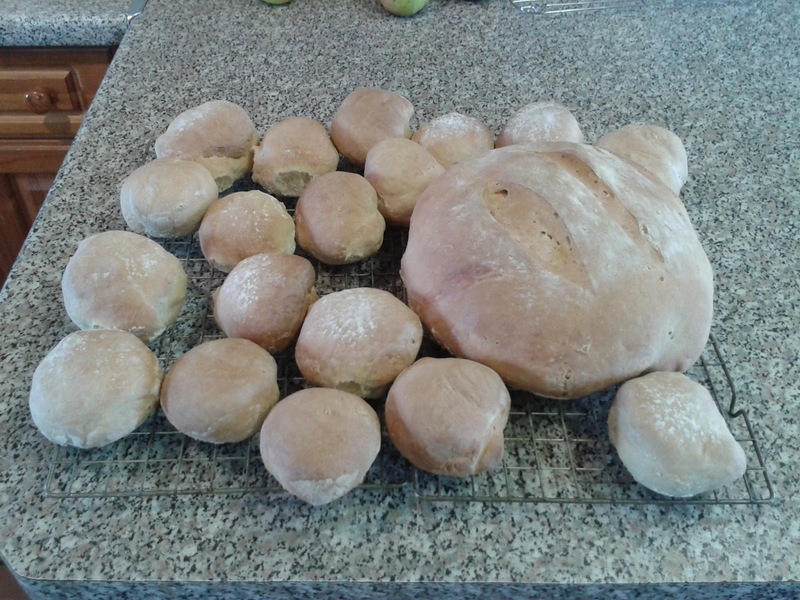 First Pic is of the bread I made yesterday and put in the freezer the minute it was cold. I'm hoping this is enough for the month for one person ( but not totally convinced) This batch was made with bread flour, yeast and oil from Lidl and the cost was £1.17., including salt too. 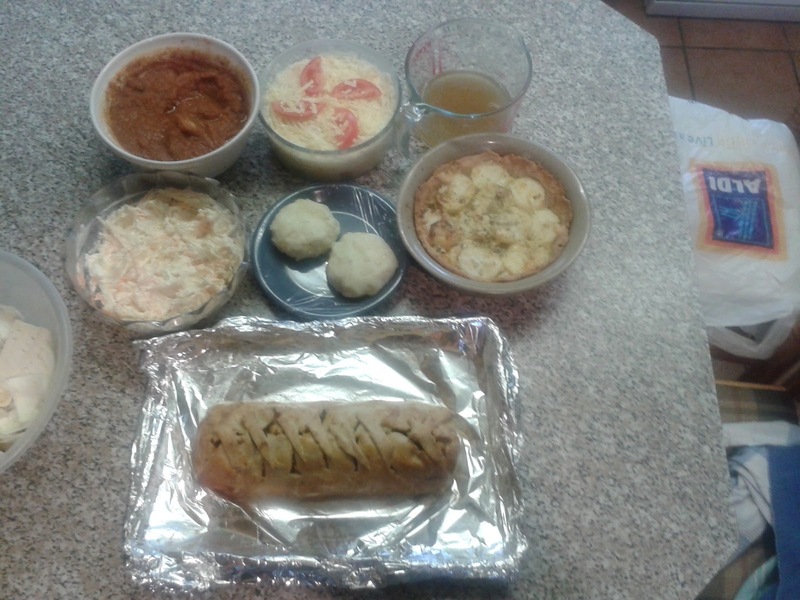 The second Pic is of the grocery shopping, mostly from Lidl, with the exception of the salad cream, gravy browning and bacon pieces, which were from Sainsburys and the potatoes onions and cabbage which were from the greengrocers. 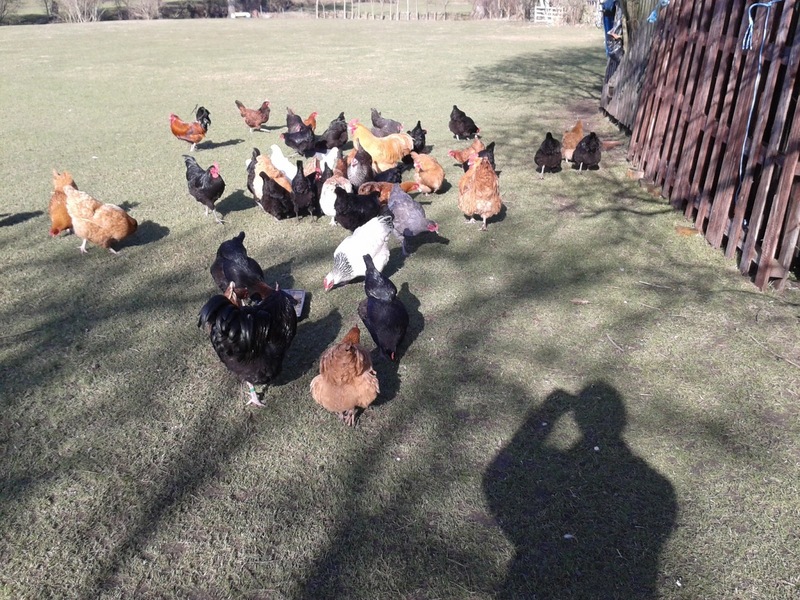 I couldn't bring myself to buy eggs when I have such beautiful fresh ones from my girls, so I am using my own and have put the money I would have paid into the hen's food fund! 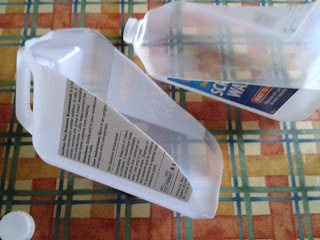 Kath from Hillside House has sent me a little tutorial on how to link to another blog. Thanks for that Kath. Here is my first go at it using kath's blog, which is definitely worth a visit. While I'm here I have to say I'm not feeling too well tonight - and I am never unwell. Hope I feel better tomorrow as Adam one of our Shared Lives Guys is here for the weekend and we are also supporting a group of volunteers who are working on "our" stretch of canal. I promised Adam he could come shopping with me to Sainsburys tomorrow morning ( yes I know I spoil these guys!! - but he loves coming shopping with me) All I have managed today is to make and freeze the bread for my challenge, sow some carrots before a deluge drove us in and rustle up Adam's favourite tea (chicken pie) Fortunately Adam was happy with D. today, visiting the canal volunteers, stacking wood for our fire and --Joy of Joy for Adam --feeding the field kitchen fire in the workshop with the gash wood. Enough for now off for a shower to see if that makes me feel better. Sometimes it will work out as under a pound and sometimes over, but the aim will be to spend £28 on 4 weeks meals for one person. This includes a breakfast, lunch (packed or otherwise) and a main meal. I haven't included drinks as I reckon I spend a pound a day on cups of tea! and there are limits to what I will put up with. What I have included is some meat product ( not a lot) and this could be replaced by tofu, soya or halloumi. I will not use any of my stores ( I could live on them for a month without shopping!) Though I think it is reasonable to assume that salt, pepper, vinegar and basic spices - say garlic granules, chilli powder and Garam Masala that are in store can be used. I have to admit at the onset that I am unlikely to eat nothing but these meals ALL the time, as we entertain quite a lot and we also have a weekend away fishing at the beginning of week 4. However I will still make the meals each day to show it can be done within the budget and freeze the meal for another time.Fair enough? My Shopping List is - Rice; Pasta; Oil; Stock Cubes; Potatoes; Cabbage; Carrots; Onions; Tins Tomatoes; Tins Beans; Bread Flour; Yeast; Plain Flour; Eggs; Salad Cream; Gravy Granules; Cheese; Sausage; Lentils; Bacon Pieces. So wish me luck as I hit Lidl and Sainsburys. Here is a picture from Youngest Grandaughter. Isn't she happy ?! This lucky girl is sat atop her own pony. She had a very bad fall from a pony last year and has worked hard to overcome her nervousness since. I'm pleased to say that she is now doing very well, achieving small jumps and cantering like a good one. I'm so proud of her. The Frugal Graduate is looking at living on a pound a day. ( I wish I knew how to do you a link to her page - perhaps my daughter will show me) This young woman is a credit to her generation and I really enjoy her blog. I think it is possible to live on a pound a day with careful planning. The difficult thing is to have a varied and interesting diet on a pound a day! I also believe that there should be an assumption of a small stock cupboard to support this. I have been giving this some thought - a lot of thought actually - hardly slept last night thinking about it ! (I'm like that, not a good sleeper) So I'm going to have a go at doing a month's menu of meals at a pound a day...watch this space! My resolution to make a present a month is coming along nicely. I was going to take pictures, but realised that the recipients might read my blog and the surprise would be spoilt. So I shall take pictures as I go along and show the stuff I make for those I know won't read the blog! I rather fancy making one of those large loose knit "snood"-type things that young women wear. Has anybody got a pattern or instructions for one? 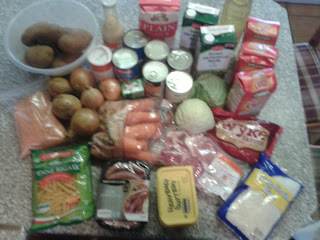 Leftovers - Part 2 - can you tell what it is yet ?! I made some shortcrust pastry ( pound flour/ half fat to flour) and halved it. 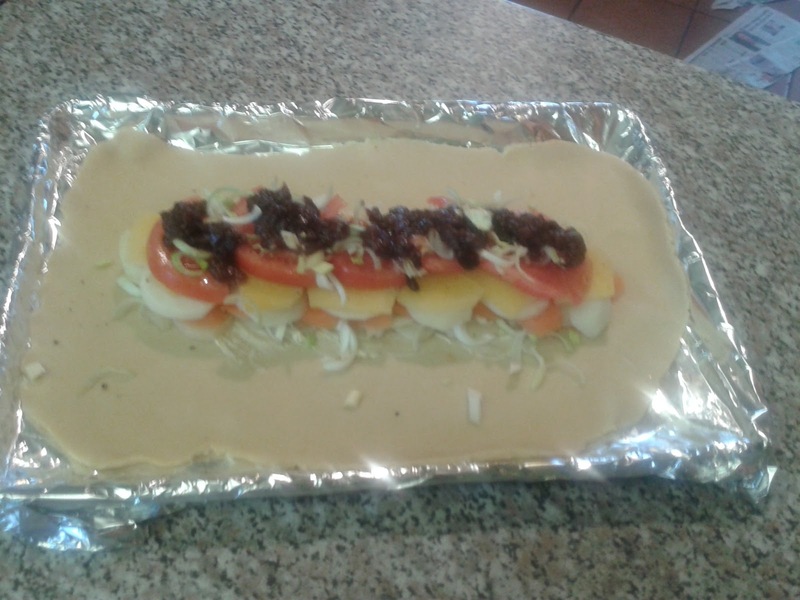 I rolled out half and put it onto a baking tray - as it will be lifted off the tray when cooked I lined the tray with baking foil to help lift it without breaking. The slice went into the oven at 180 for 45mins. I lined a pie dish with the remaining pastry and layered potato slices, onion slices, dobs of garlic butter and a sprinkling of grated cheese ( sorry, didn't tell you that I also had some grated cheese left over from lunch) I then sprinkled some dry parsley over the top and poured over the remaining milk and egg mix. This pie went into the oven at the same time and temperature as the slice . I covered the cooked mixed vegetables with the cheese sauce (warmed in the microwave) and then covered this with mashed potato. I then placed sliced tomato and a sparse sprinkling of cheese on top of this. I blitzed the odds and sods, garlic, mushrooms and tinned tomato in the blender ( not too smooth) and mixed this with the homemade tomato soup. To this I added some dried basil, salt and pepper. I cooked this to boiling in the microwave. 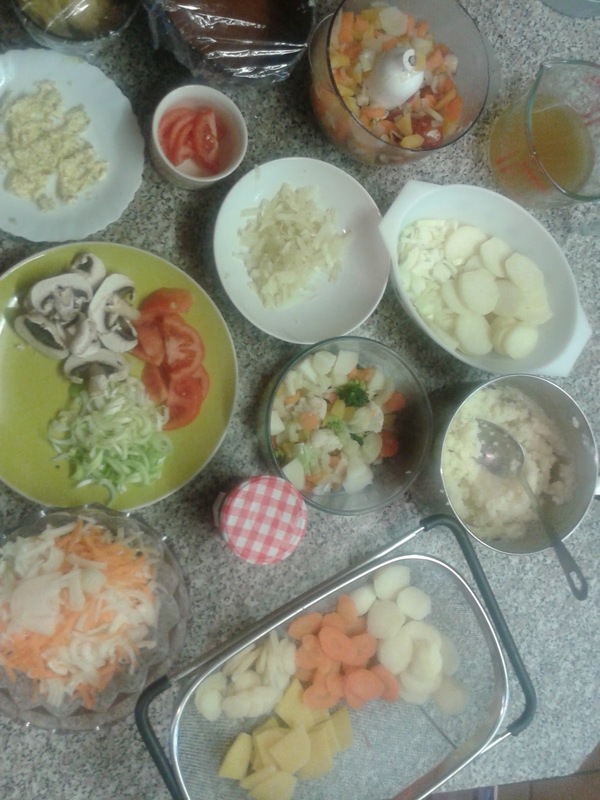 I added mayonnaise , a little salad cream and white pepper to the shredded cabbage, carrot and onion. Miscellaneous Bye products of the process !! I reckon that's enough for today - it took longer to write about it than do it ! Off to do a tad of housework, before I can treat myself to some sewing. Hope you managed to bear with me through this. I probably forgot some vital step... just let me know. I have plenty of onions, garlic, squash and potatoes in store so I reckon I should be able to make a couple of meals from this lot. I'll post later with the results. Please join me later. Oh No!..It's Mother's Day soon!! Am I the only one that disagrees with "MOTHER'S DAY"?! Since my children became adults I have asked them not to bother with Mother's Day. It was difficult to ask this of them when they were at school as there was such a build up with crafts, card making etc. and I didn't want them to feel too different from others ( well no more different than being my daughter makes you!) and I always supported them to remember their Grandmas. But personally I see no need for this, increasingly expensive and often complicated "celebration". When I was a little girl, every spring at Sunday School, we celebrated Mothering Sunday, when we were given a little card to give to our our mothers which they would use as a bookmark in their bible or prayer book. If we could find some, we would also pick a little bunch of primroses. In truth I thought even that was a little mawkish and unnecessary as my mum KNEW I loved her..every day! Just realised that after my post re. Wedding Anniversaries I sound a right old Grinch!! I'm not honestly ! I love a good party....just because....for no reason than to have a good time and see friends and family...must there be a reason? must there be a gift? As this year goes on I am bound to blog about a mega-party we have in the summer (July this year)....just because ! Here is a pic of some of the hens enjoying the sun today. They are in the field because D. threw some corn down there ! If only they would stay there! We like to think that we waste nothing and many tasks that we do have more than one result. For instance today when we were pruning and reshaping trees in the orchard we had several piles for different uses. The willows yielded some whips for weaving and garden structures and supports, some wood for burning on the fire, some sawdust for the rabbit hutches and hen houses and the remainder will go through the "muncher" tomorrow for garden mulch. We will save the munchings from the apple twigs as they are so fragrant when burnt and D. promises me that he will make me a smoker by summer. Collecting and carrying the twigs sawdust etc is made easier by my BIG BAGS!. Below is a picture of three of these bags, outside the rabbit house. 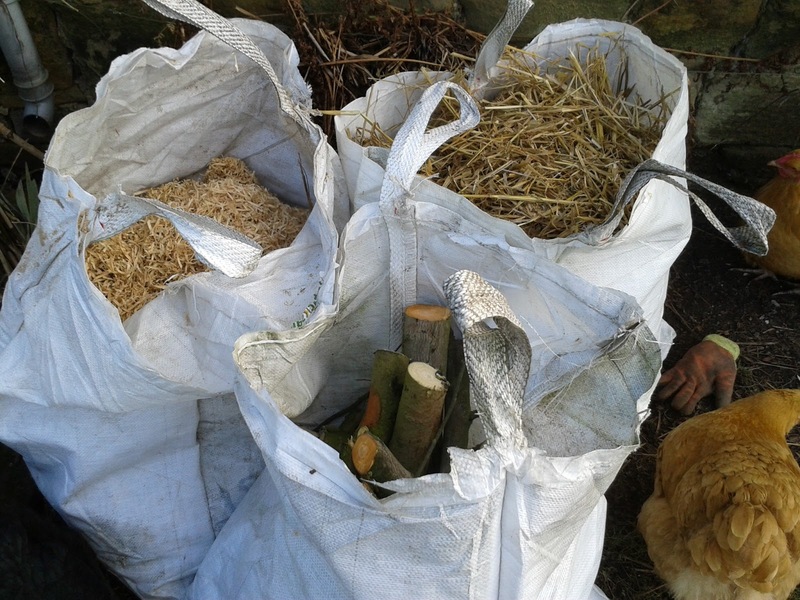 They contain sawdust from D's sawbench, straw from a large bale and logs from the tree work. At other times they contain kindling for the fire, or hay for the rabbits or prunings from the garden... they are extremely useful. Yes it's an old tonne bag, which are non-returnable (and often refused at the refuse tip) I have placed sticks across the bag where I cut with a sharp stanley knife. Note that the corner handles are placed together. I then sew along the two cut edges with a sharp large-eyed needle and thread. I save the thread from the top of feed or potato sacks as it is fine and yet extremely strong. I then turn the bags ( You get two from each tonne bag) inside out so that the edges, which can fray a bit, are on the inside. There you go ! 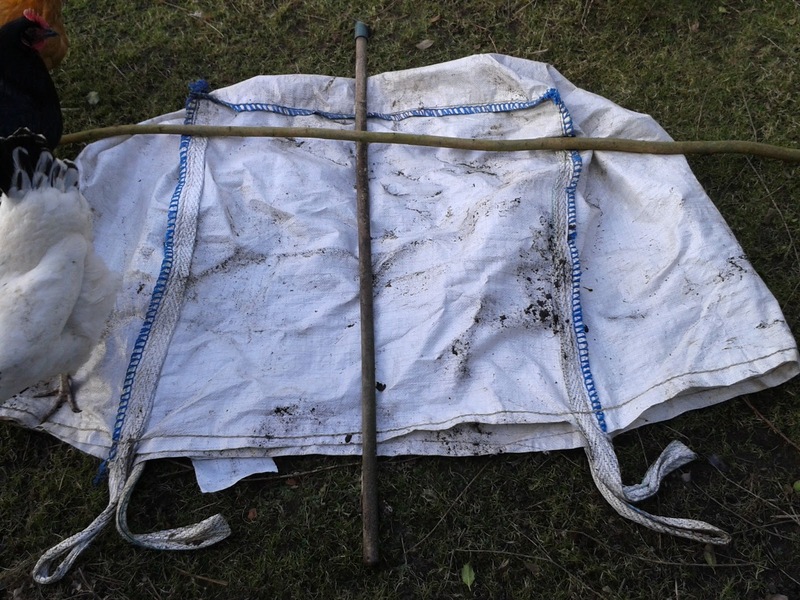 two Big gardening bags at no cost whatsoever and so many uses. 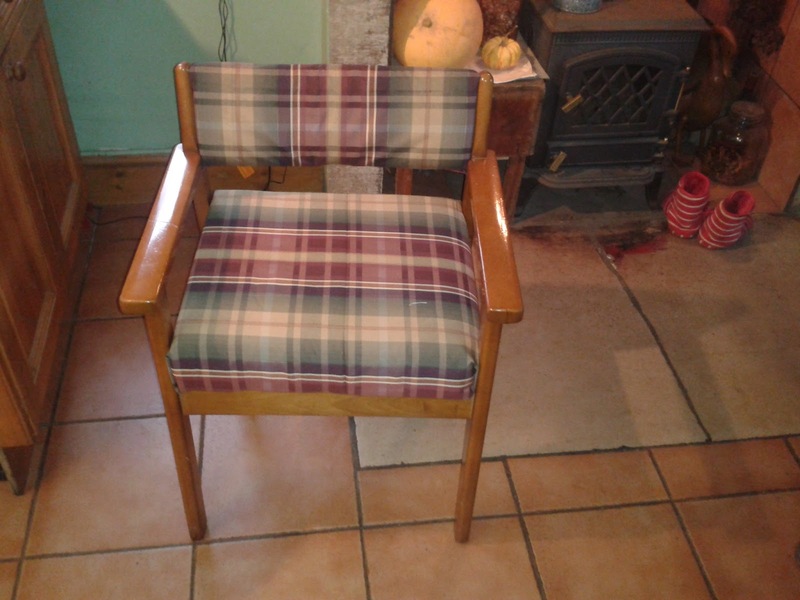 Lastly I want to show off my attempt at "upholstery". D has been using the old chair below at his computer for YEARS. The seat and cushion have both worn through. He loves this chair as it is just the right height for the job. So when I found that the seating cushions from an old sofa (that had been given to D for him to lie on to work under the car!) 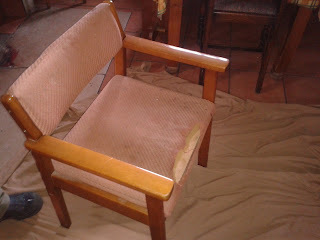 were in extremely good condition I thought it would be ideal for the job. 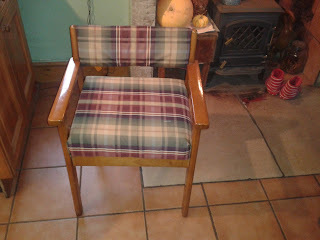 My friend Becky had given me some very smart waterproofed material which I liked the look of, so with stapler in hand I re-seated and covered the chair. I'm quite pleased with it and there was enough material left to cover two breakfast bar stools too ! I reckon that you have probably heard enough from me for now so I'll sign off hoping you keep well and have a great weekend.